Leicester's unlikely reign on top of the Premier League table will go on for a while longer at least, as the Foxes gained a five-point cushion at the top of the league after winning 1-0 at Watford, combines with fellow title challengers Arsenal and Tottenham Hotspur drawing 2-2 in a thrilling match at White Hart Lane. Things also got interesting at the bottom of the table, as Sunderland, Newcastle United, and Norwich City all failed to get points. Read all of Saturday's recaps below. LONDON (AP) — Alexis Sanchez's late goal rescued a point for 10-man Arsenal in a 2-2 draw with Tottenham on Saturday after Francis Coquelin's sending-off sparked a turnaround in a thrilling Premier League game between the title-chasing north London rivals. Coquelin was shown a second yellow card in the 55th minute for a reckless foul when Arsenal was 1-0 ahead thanks to Aaron Ramsey's first-half goal. Within seven minutes, Spurs had gone in front on goals by Toby Alderweireld and Harry Kane at White Hart Lane. However, Sanchez scored in the 76th minute from a shot that Spurs goalkeeper Hugo Lloris arguably should have saved, sealing a draw that would have been celebrated by league-leader Leicester. Hours later, Leicester beat Watford 1-0 to move five points clear of second-place Tottenham and eight clear of third-place Arsenal in its surprise bid to win the Premier League the season after almost getting relegated. "It was a missed opportunity," Tottenham manager Mauricio Pochettino said. "The way we turned it in two minutes, then you feel a little bit disappointed, frustrated, because at 11 against 10 when you turn the result, you need to keep that." Police said two men were arrested for separate public-order offenses ahead of the derby match as fans clashed with police near the stadium. Footage on the website of British newspaper Daily Telegraph, taken off social media, appeared to show some fans clashing with mounted police and one man with a bloodied face. Coquelin's sending-off was a turning point, coming when Arsenal looked composed and in charge after taking the lead. The Frenchman didn't need to make the tackle on Kane — the striker was near the sideline and Arsenal's defense was in decent shape behind him — and he hung his head immediately after giving away the foul. Sure enough, the referee came over and brandished the second yellow card. "He knows he made a big mistake," Arsenal manager Arsene Wenger said. Suddenly, Spurs were on the front foot. Stand-in Arsenal goalkeeper David Ospina saved Kane's shot when standing behind the goalline, with technology indicating the ball hadn't completely crossed the line. Then came the two quickfire goals as Alderweireld stroked in a volley from close range in the 60th minute before Kane curled in a stunning effort from a tough angle at the edge of the area in the 62nd. But there was still time for another twist as Hector Bellerin fed Sanchez, who raced through and swept in a low finish that Lloris couldn't keep out despite getting a hand on it. Spurs had more of the ball in the final stages though Arsenal could have won it, with Ramsey delaying on his shot after running through on goal to allow Kevin Wimmer to perform a last-ditch tackle. "I feel we have shown our attitude, our character. I'm happy and proud of our performance," Wenger said. "We refused to lose the game. 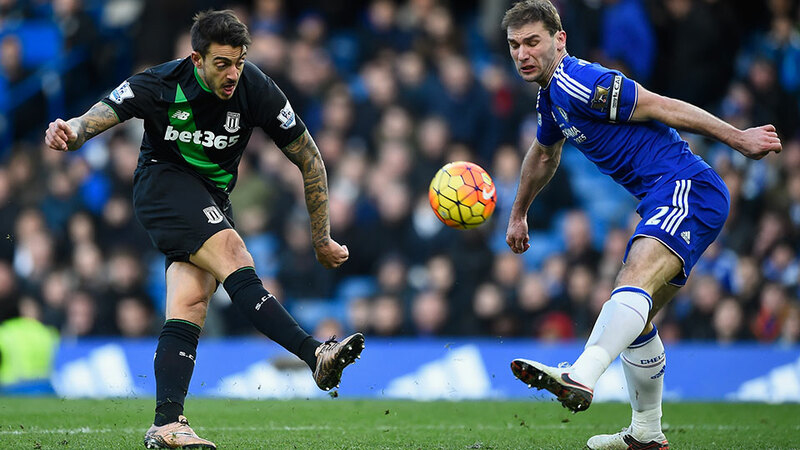 We have big regrets because I couldn't see at 11 against 11 how we could drop points today." WATFORD, England (AP) — Leicester moved five points clear at the top of the English Premier League with nine games left after a hard-fought 1-0 victory over Watford on Saturday. "It was very tough, we knew coming here would be a tough ask. Riyad has come up with a bit of magic so we are delighted," Schmeichel said. "We are in a good position, but (with) nine games (to go), a lot can happen." LIVERPOOL, England (AP) — West Ham came from 2-0 down to beat 10-man Everton 3-2 in the English Premier League on Saturday. A 90th-minute winner from Dimitri Payet capped a brilliant second-half display by West Ham. 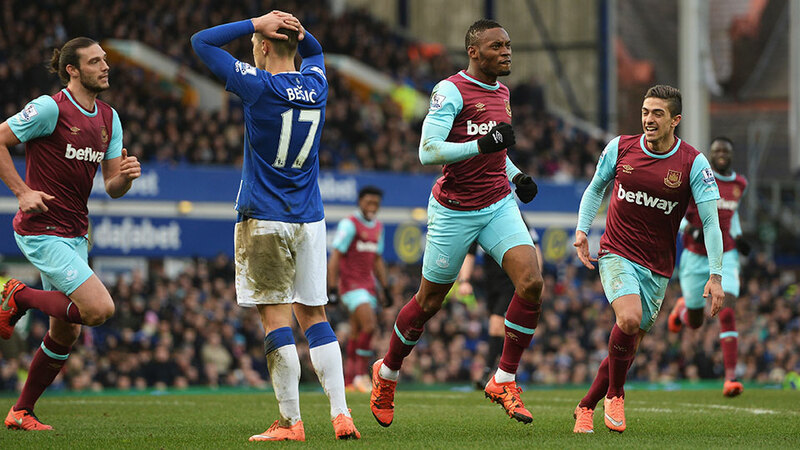 It drew level thanks to goals from Michail Antonio and Diafra Sakho. Everton midfielder Kevin Mirallas was sent off in the 34th, when it was leading 1-0 through Romelu Lukaku. Aaron Lennon made it 2-0, and Lukaku had a penalty saved, which proved extremely costly. The result means West Ham remains in fifth place, one point off the Champions League spots. LONDON (AP) — A late goal from Stoke striker Mame Biram Diouf denied Chelsea a win in a 1-1 draw at Stamford Bridge in the Premier League on Saturday. "We have rested one or two players but it's good to see the players who came in, especially the young ones, like Traore and Ruben Loftus-Cheek, do well," said Chelsea manager Guus Hiddink. MANCHESTER, England (AP) — Sergio Aguero scored two goals despite missing a penalty as Manchester City used a dominant second-half performance to thrash last-place Aston Villa 4-0 and revive its Premier League title challenge Saturday. All the goals came after halftime as Villa imploded at Etihad Stadium to slip closer to relegation with its 19th loss in 29 games this season. Yaya Toure's deflected shot gave City the lead in the 48th minute before Aguero scored in the 50th when Micah Richards's attempted clearance ricocheted in off the striker. Aguero exchanged passes with David Silva to volley in for 3-0 in the 60th and Raheem Sterling converted Jesus Navas's cross in the 66th for the fourth goal. Aguero was denied a hat trick after striking a 73rd-minute penalty against the post, having missed a slew of chances in a one-sided first half. team back in the race. With a game in hand, fourth-place City is now five points behind second-place Spurs. Home fans were frustrated at halftime, which Villa went into level despite total dominance from City. Wilfried Bony was the prime focus of ire as the striker, making his first start since Dec. 26, failed to impress. Aguero looked lively throughout though, and sparked City's second-half improvement to take his goal tally to 21 for the season in all competitions. NEWCASTLE, England (AP) — Bournemouth beat Newcastle 3-1 in the Premier League on Saturday to pile further pressure on Magpies manager Steve McClaren. Charlie Daniels struck in the 90th minute after goals either side of the break for Bournemouth, including an own goal from Newcastle defender Steven Taylor in the 28th. An Ayoze Perez goal 10 minutes from time gave Newcastle false hope. Newcastle's third straight defeat leaves them in 19th place on 24 points with just nine games left. Bournemouth has 35 points and is moving closer to Premier League survival. McClaren, who appears to be fighting for his job, said: "There are 10 games to go and we have to show fight." He urged his players "to stick together." With so many fans demanding McClaren's dismissal, owner Mike Ashley is left with a tough decision over the future of his manager, who only joined the club last summer. SOUTHAMPTON, England (AP) — Southampton grabbed a point despite being reduced to 10 men in a 1-1 English Premier League draw against relegation-threatened Sunderland at St Mary's on Saturday. Jermain Defoe scored with five minutes left and thought he got Sunderland a priceless victory in a turbulent week for the club, dominated by the conviction of former winger Adam Johnson. However, Virgil van Dijk hit back in the third minute of injury time for the Saints. Southampton captain Jose Fonte was sent off with 10 minutes to play for fouling Fabio Borini with the Black Cats forward in the clear. Substitute Defoe seized the extra space to prod home his 14th goal of the season after being played through by Lamine Kone. 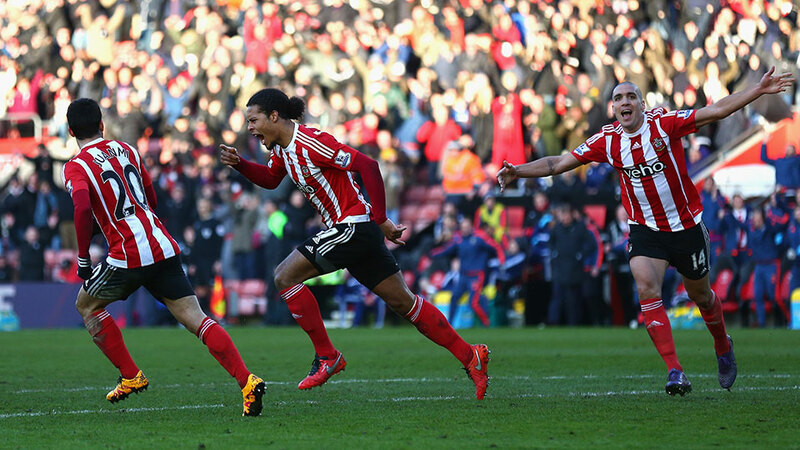 Southampton was in provisional eighth place, while Sunderland moved a point clear of the bottom three.